The gathering last night did a cheese sampling and loved your creations. They liked them all a lot, only compliments.The Smoked Gouda was rated as “best vegan cheese i have ever tasted” by one cheese afficianado, and the overall favorites were that light yellow one and the shallot one. I actually loved the Bleu the best! Thank you for giving us the opportunity to try them and good luck with the business, we hope you succeed. ​​Virgin Cheese is by far and away the best vegan cheese I have ever tasted!! ​and our customers in the restaurant love it"
The best vegan cheese I have ever tasted. I have, always and forever loved cheese!! However, due to recent a self-awareness, I decided that I did not want to eat meat in the same way I have, all these years. The next obvious step was to cut dairy as well, and for me (and my love of all things cheese) its been a struggle, lol! The flavors will blow your mind!!! So so good! If you love cheese and have been looking for something without dairy (or cholesterol :/ ) ... Look no more. with all the health benefits we get as a bonus! It's good enough to eat it by itself. The feta and blue cheese are spot-on and the Gouda is addicting. I can't wait to try your mozzarella! We love, love, love the smoked gouda. Everything about it is just right. We wish we had ordered other Virgin types - but we will be back! This cheese is just extraordinary. From Leeza of New York, New York on 8/19/2016. I am a huge fan of the Blue and Feta options. The blue is great in salads and on crackers. The feta is a little salty but a FANTASTIC substitute for the real thing. Love it in a watermelon mint salad or on a greek style baked eggplant. From Katherine McAndrew of Midlothian, Virginia on 3/24/2017. the smoked gouda is incredible. even carnivores agree that it's actually a smoked gouda cheese. regardless what type of milk is used. Virgin nailed it. i can't wait to try the bleu. From anthony smith of Greenville, Indiana on 2/11/2017. We've now eaten all six Virgin Artisan Vegan Cheeses. I can review the final three! Yay! Sriracha Cheddar is all about flavor and not a bit about burn/pain! It feels wonderful on the palate and every bite leaves you wanting another taste. We tested it out on Gardein Garden Veggie Burgers on which it was terrific! The promo gives you suggestions for using this cheese, and you will come up with plenty. Virgin Bleu is tangy and satisfying...draped over warm veggies, melting and soft, it is dynamite, simply fabulous! You will want to use it is a topper for, well, everything...If you love the flavors of lemon and dill, then this fresh and wonderfully quirky cheese is for you: Virgin's Lemon Dill cheese is the perfect elegant fusion of these two tastes. We had it over asparagus, the asparagus was warm and we dolloped on the cheese as is so it got just as melty as the heat from the asparagus let it. I can envision that the lemon dill will work fabulously -- we will of course be trying this! -- on toasted bagels with Sophie's Kitchen Vegan Smoked Salmon as well as dolloped on Sophie's Kitchen Breaded Vegan Fish Fillets or Vegan Scallops or Vegan Crab Cakes or Gardein's Fish-less Fillets or....Well, you get the idea! This lemon-dill combo is beautifully rendered and it works! 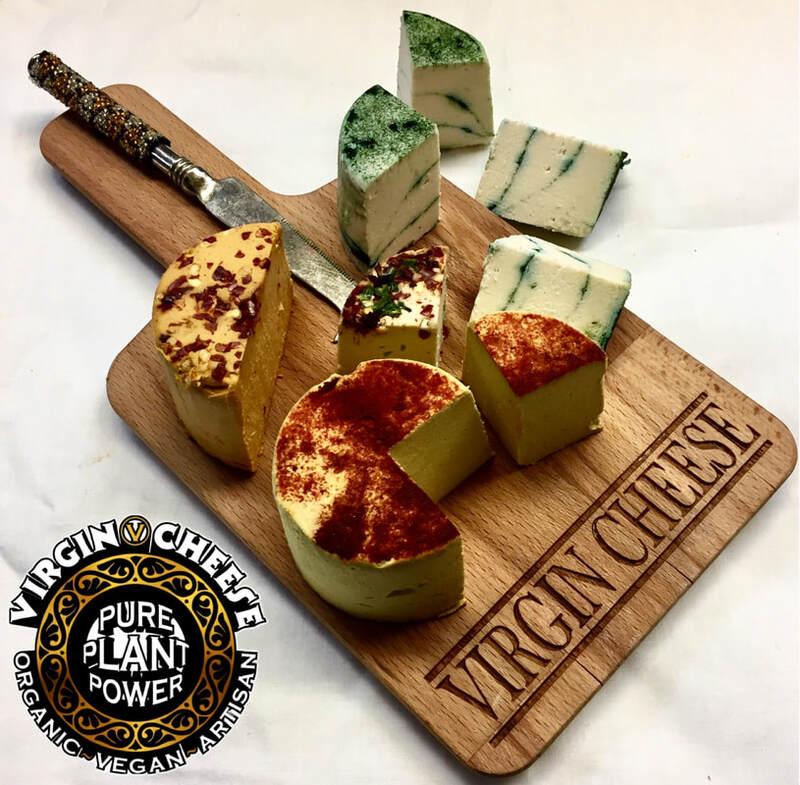 Virgin Artisan Vegan Cheese in all six of its incarnations is so good and so versatile that it is kitchen-staple-worthy! From Leeza of New York, New York on 9/10/2016.